"So sad to hear about your loss. 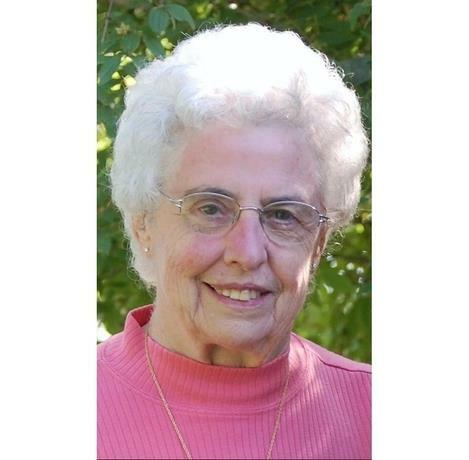 My heart goes out to your..."
"One of the really nice, decent people I had ever been..."
"May you rest in peace Mary you were always such a nice..."
Memorial Mass for Mary L. Hanson, 83, Lawrence, will be held at 10:00 a.m. Friday, September 7, 2018 at St. John the Evangelist Catholic Church. Burial will be held at a later date next to her husband at Leavenworth National Cemetery. She passed away Tuesday, September 4, 2018 at Arbor Court at Alvamar. Mary was born in Eudora, KS the daughter of George and Viola (Kennedy) Born. She graduated from Eudora High School and went on to attend KU for two years and graduated in 1957 as an X-ray Technician. She was a member of the St. John the Evangelist Catholic Church. She worked for 22 years in medical transcription at Lawrence Memorial Hospital until she retired in 1998. She married David Francis Hanson on May 2, 1957 in San Diego, CA. He preceded her in death February of 2005. She was also preceded in death by her sister, Martha Eder and daughter-in-law, Rachel Hanson. Survivors include her two sons, Timothy Hanson, Frisco, CO, Michael (Lori) Hanson, Lawrence; four grandchildren; David Hanson, Abby Hanson, Paige (Cody) Blake and Haley Hanson and two great grandchildren; Carlie Morris and Sebastian Santoya. The family will greet friends from 6:00 p.m. until 8:00 p.m., with a Rosary starting at 6:00 p.m., Thursday, September 6, 2018 at Warren-McElwain Mortuary in Lawrence. Memorial contributions may be made in her name to St. John Catholic Church or Lawrence Memorial Hospital Endowment Association and may be sent in care of Warren-McElwain Mortuary.